Also released today was a letter from Superintendent David Healy to the school community that further explains the circumstances that have led to the planned March 5 trip to Trenton. 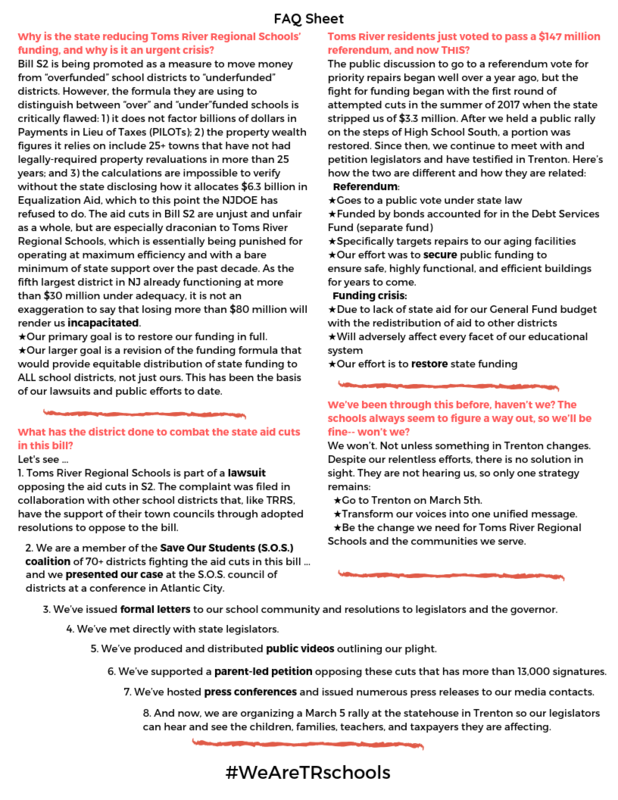 Additionally, Toms River School Board President Joseph Nardini, who reached out to each mayor and councilmember within the greater Toms River area on Monday for their support, issued a formal letter to the community through local media outlets. Healy and Nardini's letters, as well as the Trenton march flyer can be accessed and downloaded through the links at the right. The march on Trenton is planned to take place the day of the governor’s budget address. The district will be joined by many of the 70+ affected districts that comprise the Support Our Students (S.O.S.) advocacy group and coalition. TRRS will be providing students SOS-themed white t-shirts, and encourages other supporters to wear white to the peaceful march, which is intended to show legislators just how many students and educators will be adversely and dramatically impacted by state aid cuts that, the district argues, are based on a flawed funding formula. 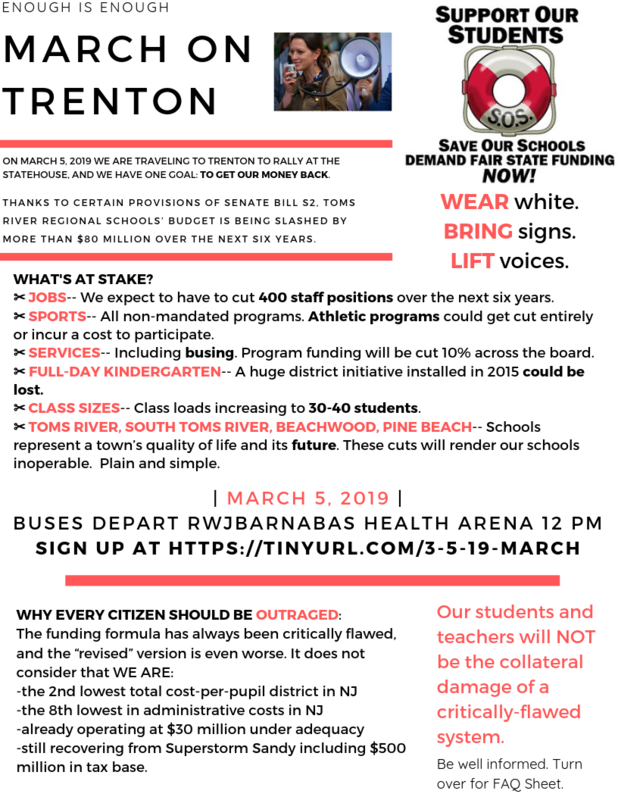 Toms River Regional Schools will be providing a set number of buses for its students and staff members, which will depart RWJBarnabas Health Arena at noon March 5. Additionally, it aims to provide buses for district parents and community members, and it encourages those interested to RSVP via this link so that it can determine its transportation needs for the day. Print, share, and utilize this flyer to sign up to visit Trenton March 5.